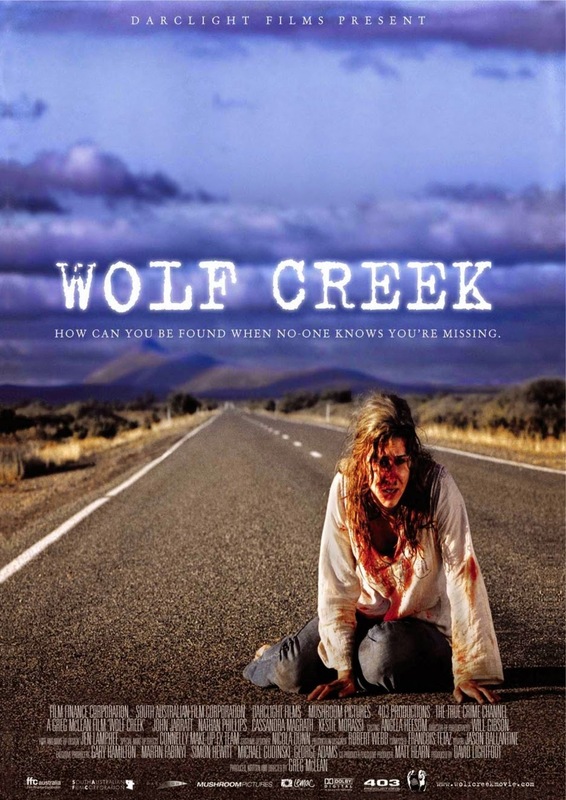 Tag line: "The Thrill Is In The Hunt"
In its opening credits, Wolf Creek, a 2005 horror import from Australia, claims to be based on true events. After looking into it further, it appears the film actually draws from several real-life cases, including the notorious “Backpack Murders” of the 1990s as well as a more recent episode in which a British tourist and his girlfriend were kidnapped in the Northern Territory. Truth be told, I was kinda happy to hear that no single incident inspired the movie. The thought that a guy like Mick Taylor is out there, roaming the Australian Outback, is enough to keep you awake at night. In the small beachside resort of Broome, Western Australia, British pals Liz (Cassandra Magrath) and Kristy (Kestie Morassi) team up with local boy Ben (Nathan Phillips), who has agreed to drive them to Queensland. Along the way, the three decide to stop off at Wolf Creek, where, tens of thousands of years ago, a giant meteor crashed to earth, leaving one hell of a crater behind. After taking in the sights, they return to their car, only to find that it won’t start. At first afraid that they’ll be forced to spend the night in the middle of nowhere, the trio is relieved when Mick Taylor (John Jarrett) shows up on the scene and agrees to tow their vehicle back to his place, where he has the necessary parts to fix it. But as the friends will soon discover, Mick is no ordinary mechanic, and his motives are much more sinister than they could have possibly imagined. While its claim that it's "based on true events" may be a bit suspect, there really is a place in Western Australia called Wolf Creek (though it’s spelled “Wolfe Creek”), a National Park that is, indeed, home to one of the largest meteor craters in the world (the filmmakers took full advantage of this natural wonder, which is as imposing as it is picturesque). But as impressive as it is, this crater isn’t what you’re going to remember when thinking back on Wolf Creek. What stays with you is the character of Mick Taylor, the boisterous Aussie with a "thing" for torture. Those moments when Mick, expertly portrayed by Jarrett, is doing what he does best are gruesome, to say the least (the “head on a stick” scene always makes me cringe). Yet what made Mick's actions truly horrifying was how friendly and affable he seemed at the outset, when he offered to tow the friends' car and fix it for free. Whenever I see this sequence, I can’t help but put myself in the three eventual victim's shoes, and every single time, I come to the same conclusion: I, too, would have gone with Mick Taylor. I’d have gladly let him tow my car, and would have thanked him when he offered me a drink of water once we got to his place. Which, of course, means I would have been in a hell of a pickle in a few hours' time. This is what makes Wolf Creek such an effective horror film. Over the years, movies have made us think twice about doing many things, including going into the water (Jaws), picking up hitchhikers (The Hitcher), or strolling into an unfamiliar house (The Texas Chain Saw Massacre). The lesson in Wolf Creek? You can't always trust a Good Samaritan.